This little gazebo has been in our yard since 1991. Jim built it himself, with no pattern, just looked at pictures. It’s my favourite piece of our yard. It has many memories. It is the backdrop for so many family pictures, graduations, anniversaries and weddings. A band has performed in it, children have played in it, a marriage was sealed in front of it, graduations were captured around it and peace has been found in it. I love to take my morning coffee and sit on the step of the gazebo and look at my yard, watch the world, feel the sun, remember the memories, ponder the future. Over the years it’s transformed and recreated itself and thrives in every season. Without it, my home would be missing a part of itself. 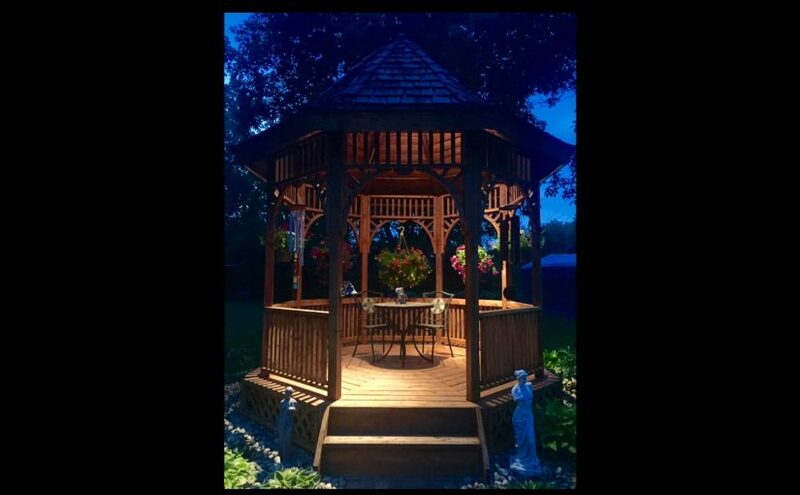 Summer brings many beautiful places to be and love, but my favourite will always be my gazebo.